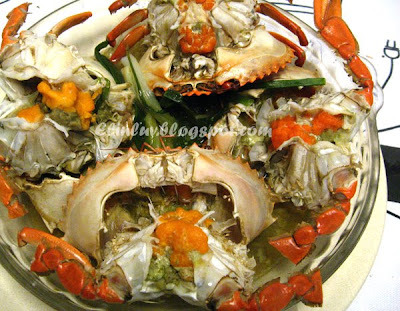 Clean the crabs and open the shells . Remove the gills and sac . Season with sea salt . 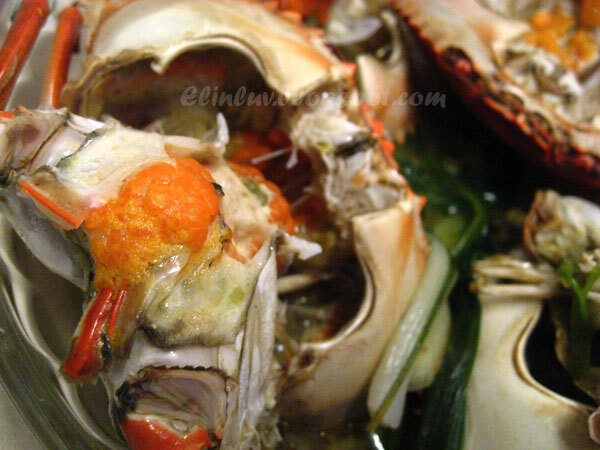 Arrange the crabs on a pyrex dish with the spring onions either on top or bottom of crabs. 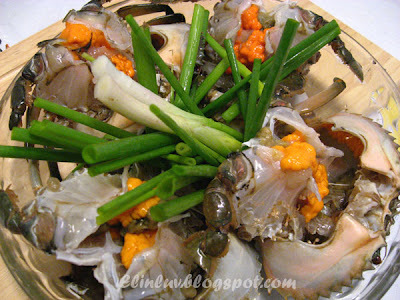 Steam for 10-15 minutes on high and 5 minutes before taking out of the steamer, add in the chinese wine. 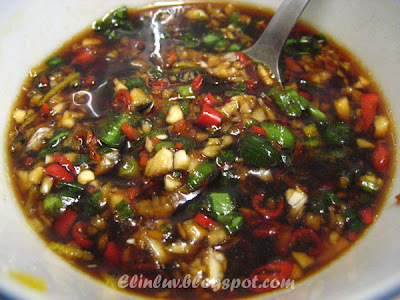 Serve hot with tongue tingling chillies dip. To prepare the dip sauce :- Mix all the ingredients above together in a sauce bowl. Serve it as a dipping sauce for the steamed crabs. I want this too...hmm...cannot tahan liao, I must have it now, sob sob. never mind the cholesterol, i take u to polo ground.. go for 5 rounds and u can have more than 1 crab!! 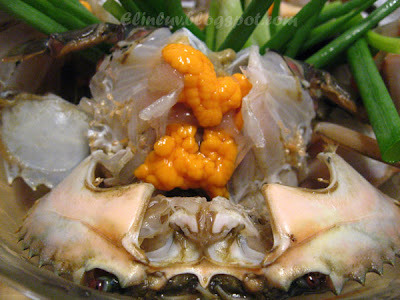 crab is delicious! I love it! Ooooooo....I'd die for this!!! Drool!!! Yum! Yum! 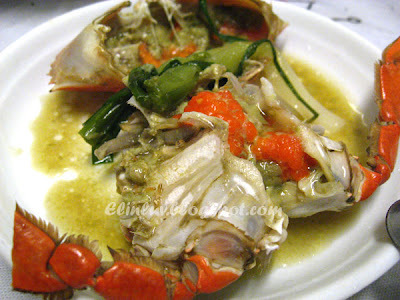 similarly, i also cooked crabs yesterday in sweet and spicy..will do the posting later. 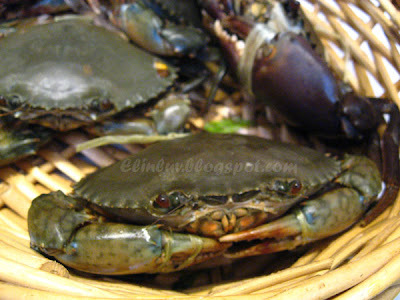 love crabs so much! The roe is a stunning color! Hmm...can I come over to your house? OMG! Look at the roe! The crabs here don't have such "good stuff"! Talking about crab! I haven't had any of these since a long long time! 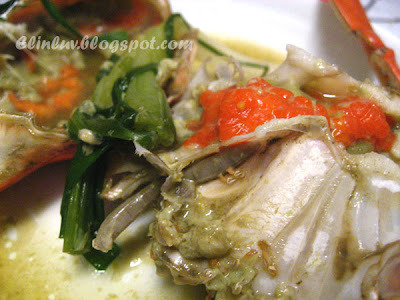 Frankly, not easy to get good & filling crab nowadays. 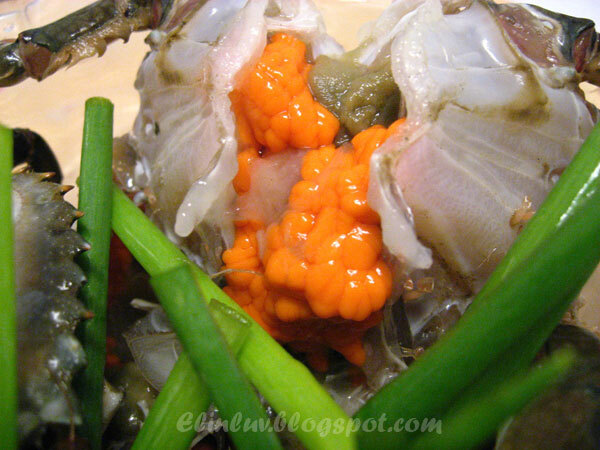 And wild crab is fat & tastier.